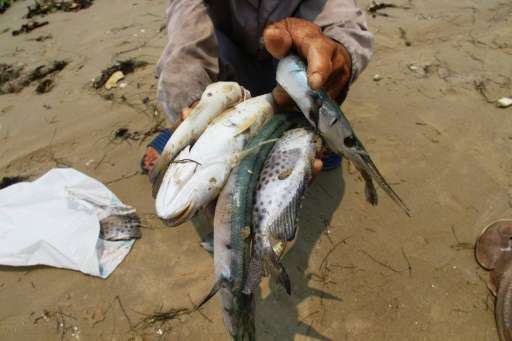 Hundreds of fishermen in central Vietnam have filed lawsuits demanding more compensation from a Taiwanese firm accused of dumping toxic waste in the ocean that killed tonnes of fish, activists said Tuesday. The mass fish deaths in April ravaged livelihoods in communities along the central coast, where fishing is the main source of income. In a rare case of civic action against big business in authoritarian Vietnam, large crowds of fishermen have swamped a courthouse in Ha Tinh province since Monday to file 506 lawsuits against Taiwanese conglomerate Formosa. The company says it has already paid $500 million in compensation after Vietnamese officials blamed its multi-billion-dollar steel plant in the area for the fish deaths. But local fishermen said they have yet to receive any money and are demanding Formosa close its plant and provide additional payouts. Photos and videos on social media showed hundreds gathered outside the courthouse in the town of Ky Anh wearing white T-shirts printed with an image of a fish skeleton and chanting passages from the Bible. "We demand compensation from Formosa and closure of the plant in Vietnam and ask them to clean up the environment in the area," said Dang Huu Nam, a Catholic priest helping lead the activists. Security forces have been widely deployed in the area, activist Tran Minh Nhat told AFP, but no clashes were reported. State media said earlier that compensation would be paid out from early October after the final tranche was received last month. It was not clear how much would be disbursed to affected fishermen. Tonnes of dead fish, including rare species that live far offshore, began washing up along Vietnam's central coastline in April. Frustration at the authorities' perceived reluctance to blame Formosa led to protests across the country, with police stepping in to arrest scores of demonstrators. Formosa is no stranger to controversy in Vietnam, where anti-China riots at its Ha Tinh steel plant killed three in 2014 and a scaffolding collapse killed 14 last year. People demonstrating for environmental rights are arrested while the corporate officials responsible for the pollution drink tea with the government officials.